I'm not sure that Mrs S wants our wedding vows likened to a disentanglement puzzle! I have to say that she (as are all women) is a puzzle far harder to solve than anything that Puzzle Master has to offer! I'm reaching the end of my stash from them now and am going to have to order some more - there's a few I have my eye on. I can't allow myself to run out of things to blog about can I? You all know how I love my disentanglement puzzles and I took this with me to London to visit my mother. I needed one that would not take up too much space in my bag and which (hopefully) would not take me too long to solve and write about. She gets rather upset by my habit/hobby - she thinks it's all rather childish and really doesn't approve! Luckily I'm a boy who never really listens to his mother! This time it was to be the Wedding Vows puzzle. 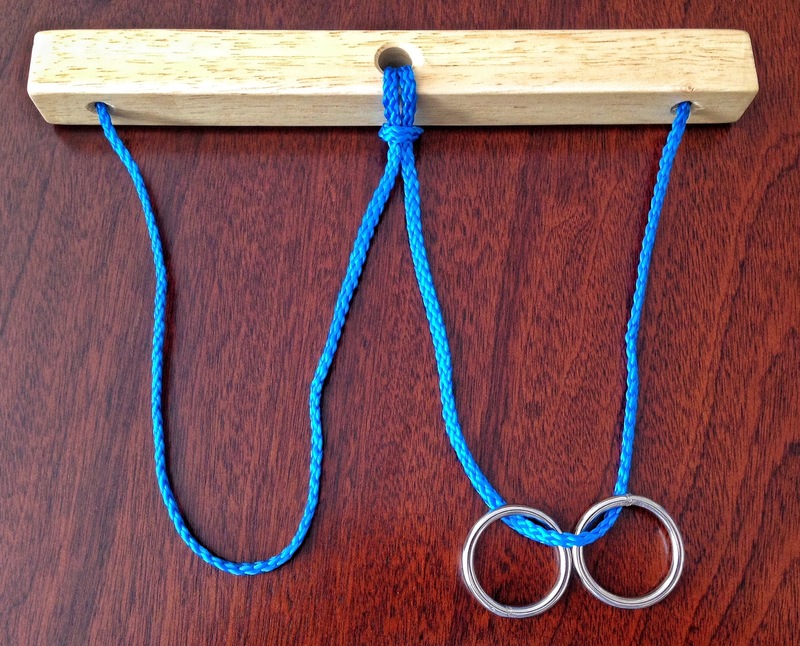 So out it came from the nice clamshell box and the diagram on the back makes it clear that the aim is to move one of the rings on the string to join up with its partner on the other loop. There's a lot of guff about things old, new, borrowed and blue which you can just ignore. I guess you can also ignore the stuff about not giving it to babies aged 0-3 because who would be that stupid? The photo was duly taken on my mum's dining table using my iPhone, edited on the phone using Snapseed, and made ready for upload. Then Google had me stymied - there appears to be no way to upload photos to picasa (where the blog photos are held) - for a web based company they really don't make it easy! In the end I ended up buying an app for 99p - see how much I spend for your pleasure! The picture uploaded, I was ready for puzzle solving. I was kind of hoping that I'd chosen one that I could manage in a fairly short time and not disturb anyone or at least upset my mother! This particular one was just a level 8 on Puzzle Master's scale of 5-10 so should not be too difficult! It folds up quite small but when opened out it has dimensions of 17.8 cm x 22.9 cm. no solution is provided and I very much doubt that you will need one but if it proves to be too tough for you then download the solution from here. It's quite a nice idea and I think would be a good one for family, friends and newbies to this sort of puzzle. 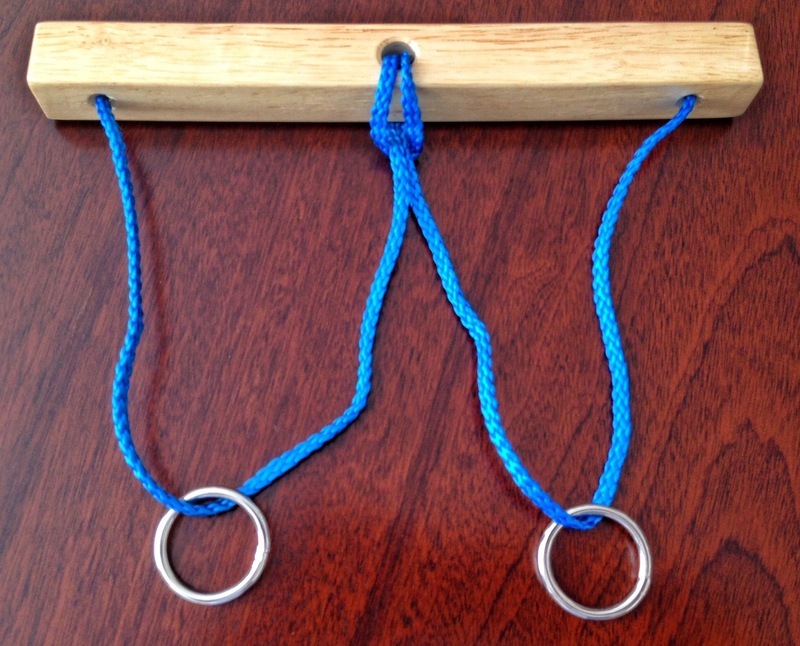 I don't know whether it gets knotted up because I solved it too easily - I suspect that it isn't easily knot-able because there are so few possible things to do with it. At $10 you cannot really go wrong - it's well made and quite cheap. Well this review didn't take too long so the puzzlemother should have nothing to complain about! Now it's time to take the solved photo and edit and upload before posting this review! She'd only like it if it didn't stop her spending on the card! Nice blog link - thanks for that!